This is well worth the money to pay for it. Very sturdy and the tablet fits right in. So many different pocket and hiding spot inside. I really like the pocket for your phone and the slit for the headphones. Thanks so much. The Wenger Swiss Gear backpack is a multi-functional piece that has a variety of necessary features. Made of polyester, this backpack also boasts a laptop sleeve, airflow back system, water bottle pocket, and comfortable shoulder straps for lengthy wearing time. I really like the ScanSmart feature, haven't used the bag on a flight yet, but my friends and family that have say it's really convenient so you can get by security faster (sometimes). It has lots of room, my laptop and tablet are secured really well. The pocket for the laptop (scansmart pocket) has a strap for your laptop to help prevent it from sliding around. The bigger pocket (main) I carry my kids handheld video game systems and a set of clothe form them, I would buy it again. Zipper lost tracking after one year of use, have to zip a specific way to get it closed. Not great quality. But Scan Smart feature was a savior as a frequent flier, great to not have to take the laptop out of the bag, so I keep using it despite the broken zipper! Nice backpack - I purchased for the added feature of being able to slip the laptop computer into its own separate section. Well made features - especially the straps and padded back. I have purchased Wenger products in the past. 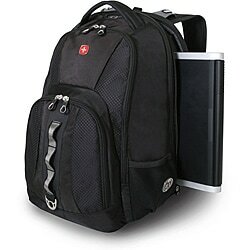 I have needed a backpack for traveling with my computer for a few years. Looking around at prices and quality I went with Swiss Gear as it was a brand I know and this bag is TSA compliant and has many conveniences that I like. Also, it seemed a good deal from Overstock. Comfortable to wear and holds all my things perfectly. I love the laptop compartment.....just perfect! I bought this for my teenage grandson & grandpa felt it better suited him :) The more I look at it the more I want 1 too ;D lol Our grandson may not get one, who's to say... It's a Great Backpack, at a Great Price. For anyone who travels, hikes or this is excellent for a student too. I'm telling ya, Overstock does it again & makes my & my family's life better. Perfect for me at college! It’s comfortable for my long days! Like the style takes the pressure off my back when carrying. Good quality, will last a long time. Well made. Perfect for 17in. Computer. Lots of room. Lot of space and durable!! Looks great and fits just perfect, I'm 250 and 6,3 by the way. Great price and know from previous purchases the quality is great. We needed a bag to carry our tablets and smartphones. Along with other devices. Always heard good things about swiss gear products.